The convenience of purchasing food and beverages is taking on a new twist after a Successful pilot project that involves a conference center, a major bottling company and technology. charge would appear on their hotel invoice at checkout. Yoon says M2M (machine to machine technology) is just the beginning. She sees other products and services offering this service to customers, thus improving the accessibility of food and beverage products. She says the idea to implement this technology came during a business trip when a colleague of hers had no change to purchase a drink. "Most business travelers do not carry coins with them," She adds. "However the common dominator in hotels is all guests have a room key card. It's an easy solution for all parties involved." Yoon says this also makes it convenient for international travelers who don't want to exchange bills for coins. During the pilot project, an increase in consumer sales was achieved, along with an improved guest experience. The cashless systems also reduced the hotel staff's time on supporting coin exchange and coin jam problems. "We're anticipating it will continue to be positive for sales because it's really about convenience," says Daryn Everett, full service vending manager, Coca-Cola Canada. "With access to a hotel room card or a cell phone, sales are increased from accessing our machines," he adds. "Even families who enjoyed the pool area at the resort embraced the service and convenience," Yoon adds. "Their room key card is always with them and it's convenient option to use when you don't have coins, especially at a pool side." Everett says measuring consumer feed back was an important part of the project and so far, guests have been pleased. Overwhelming results included an increase in sales, no instances of attempted vandalism to the machines and most significantly, improved guest experience. "The owners, management and staff of the Ambassador are absolutely delighted with the cashless vending program and we want to keep it forever," says Venicio Rebelo, general manager, Ambassador Conference Resort." The ease of use, the convenience for our guests, the absolute elimination of attempted vandalism to these vending machines, the increase in usage ... this a definitely a Win Win Win Win Win solution. We are indeed privileged and fortunate to have been considered as the test pilot for this exciting innovative technology advance." 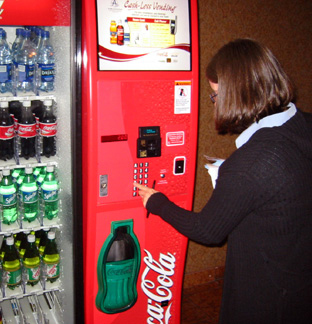 Yoon says vending machines in hotels are easy targets for thieves because the machines are un attended and often placed in dark corners. She says since the hotel implemented the program, these machines have had zero vandalisms. In fact, thieves have been targeting other machines that still accept coins. Had the option to use their room keycards or cellular phones to purchase Coca-Cola beverages that range from waters and 100 percent juices to soft drinks, juice drinks and ice teas. 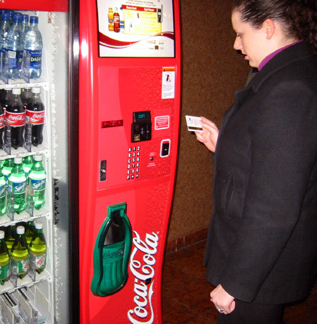 vending Industry here in Canada, but it will change the availability of food and beverage products "
The Ambassador Conference Resort was selected for the pilot project because of its clientele. They are known to accommodate high tech customers and they were the one of the first hotels in Ontario to go wireless. cStar Technologies-Vending and wireless technology enabler In November of 2005, the three major Canadian Telcos; Bell Canada, Rogers and Telus, formed a consortium to move forward on mobile commerce initiatives in 2006, to pursue micro payments. Mobile commerce transactions from vending machines and other points of service would appear on costumer cell phone invoices. The cell phone would act much like credit cards.